Derry-Londonderry continues to embrace its title of City of Culture this year with vibrancy and colour – ReFound are delighted to be a part of it with an exciting project bringing local business and artist communities together, creatively focusing on that all important member of our household – THE CHAIR! 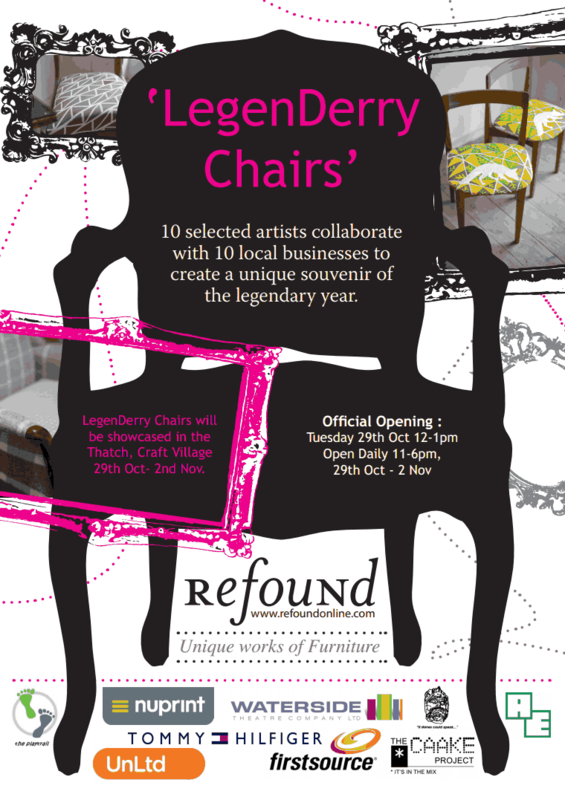 Initiated in partnership with interdisciplinary art project The CAAKE Project, ‘Legenderry Chairs’ see 10 local businesses partnered up with some of the North-West’s finest up-and-coming artists to re-imagine 10 reclaimed chairs, creating a selection of legendary themed ‘works of furniture’. These unique souvenirs of the legendary year will be exhibited in the city’s Craft village from 29th Oct-2nd Nov and then housed permanently in each partner businesses’ premises as a lasting legacy of this special year. The exhibition promises to be a spectacle of innovation & creativity with a recycling ethos, creating a link between business and arts to continue the legacy of the City of Culture beyond 2013. So come and see us and be inspired by the legendary potential of the humble chair! ‘Legenderry Chairs’ exhibition runs from 29th October – 2nd November, open daily 11-6pm in the city’s Craft Village, with the official launch 29th October from 12-1pm with light refreshments and the chance to meet the artists and businesses involved.